I whole-heartedly agree with your assessment of the new station - great variety but too many repeats - and not repeats of the songs you'd like to hear. Like you, I've been surprised many, many time by hearing something I had forgotten all about and not heard on the radio in a long, long time - but too many times they're playing something so obscure or off the wall that it just doesn't fit - and I find myself tuning away trying to find something else, something better on another station. I think you hit it right on the head when you said that when they're on, they're right on the money, and it's the best mix of music on the radio today - but when they're off, they're way off - and it just doesn't work and, from the sounds of things, most listeners are feeling the same way and already searching for something else. I'm just not sure it can work. They'll play a dozen great songs in a row - things you haven't hear for ages - but the rest of the time is filled with too many songs by the same artists which takes away that whole feeling of variety that has been making them sound so different. Then again, Chicago really needed something like this - and you've been saying that for years - so I'd have to say that this has been a very noble effort. Everybody I know has at least tried the station - and most really seem to enjoy the newness of how fresh things sound by hearing the songs they haven't heard in a long, long time - but I say stick with what's working and leave the obscure stuff behind. I'm with you on this one. Please know that I'm not trying to sway the opinion of any listeners of the new Me-TV-FM ... if anything, I'm trying to reach out to the station to say "Please be aware of this ... and fix it ... because you've got a GREAT concept here ... and the potential to be a great radio station ... but you're already starting to lose your audience because nobody seems to be watching the store!!!" I have copied them in on ALL of our reviews thus far ... and will do so on this one, too ... ALL in an effort to help make this the BEST radio station on the dial. I've said it a dozen times already ... you guys are SO close to getting it right ... but LISTEN to the station for a few hours with an open mind and you will quickly see where the flaws are. I'm getting close to giving up on 87.7. You're 110% right about songs not being played for a reason. My husband and I look at each other and he's a music buff like you and says "I've never heard this before". Thanks for keeping those of us who don't or are not able to get Me-TV-FM up to date on their progress. From what you are saying, I probably would have pulled the plug on them weeks ago. You mentioned Norman Greenbaum and the car accident he was in. Remember his follow up hit, CANNED HAM, which somewhat did OK here in OKC? I did not know that Don "THE HAPPY WHISTLER" Robertson had passed away. FH is the only place I learn of the passing of these artists who were not as well known as some of the larger one. At times, I have often gotten Robertson's tune out of 1956 somewhat confused with Charlie Blackwell's 1959 instrumental MIDNIGHT OIL along with his whistling. out a weekly survey of the hits being played on their particular radio station. Interesting! I just wonder if any top 40 (?) radio stations out there are putting together their own weekly radio surveys. And finally, I just went online and found out that a lot of people started playing and remembering Roy Orbison's 1965 tune RIDE AWAY (MGM). As I am sure you know, it is being used in the background of a Geico commercial. Why the powers that be decided to use that particular song, I don't know. Good tune though. Another commercial being played here in OKC (don't know if it is being played up in your part of the country), has to do with Sleep Number Mattresses with the Token's THE LION SLEEPS TONIGHT being used in the background. We used to featured Norman Greenbaum's "Canned Ham" every Easter along with "I Wanna Love Him So Bad" by The Jelly Beans. With Easter falling this weekend, it's funny that this should come up now! I, too, wondered who thought to dig out this old Roy Orbison chestnut ... certainly not one of his better-known tunes ... and not really a hit ... but it just proves again the power of the musical connection if only listeners are exposed to this great music sitting in the vault somewhere. (Kinda like resurrecting the Roger Miller / "Robin Hood" song for those Android commercials ... man if that one doesn't win every advertising award this year, I'll be shocked!) "Ride Away" did make The Top 20 in Cash Box and Record World ... but stalled at #25 in Billboard ... that's a topic we'll be taking on shortly here in Forgotten Hits ... how could there have been such a great chart discrepancy between the three major trades back in the day when they were all essentially polling the same sources ... so stay tuned for that one. Hard to believe that anyone could write a book about Bread and only interview guitarist Rob Royer, who was only in the group for a very brief time. My archives include an extensive audio interview with David Gates, who, for all intents and purposes, WAS Bread. Despite having written and sung the very best output of one of the '70s finest soft-rock bands, Gates could not have been a more pleasant, down-to-earth and ego-free interview subject. "Baby I'm A-Want You," Everything I Own," "The Guitar Man," "Lost Without You Love," the shimmering "If" and other Bread hits are among the best-crafted pop records anyone has ever made. I remember David telling me how when Bread's debut hit, "Make It With You," began climbing the charts in 1970, his local newspaper championed the success of their hometown hero via an article which identified his breakthrough hit as "Naked With You"! A percent of the notification list went out as an "unblind" email yesterday ... long time readers know that this happens every couple of years or so ... but that we always try and keep our mailing lists private. And, unfortunately, there are those on the list who never fail to jump at and seize this opportunity to poach names for their own mailing lists. It's unfortunate and I apologize. I have tried like hell to like 87.7. I mean I've really made an effort to enjoy their"presentation" and the fact is you know I'm a WLS-AM employee. The new outlet darn near won me over last week when I heard the classic Beach Boys tune "Sail on Sailor" and Stevie Nicks' ethereal "Sara" in a span of about 45 minutes. So much for 475 foot home runs. Let's get to the potholes. This past Saturday and Sunday I endured "Muskrat Love", arguably one of the five or six worst songs in American history, twice in less then 24 hours. 24 freakin' hours. What's the matter, couldn't they dig up something by the Royal Guardsmen? The Captain and Tennille gave me my first migraine. Later, I endured a "Muskrat" cover by America. Hearing these mind busting disasters reminded me of just how overrated the 70's really are. "Muskrat Love" is roughly as much fun as a 45 minute erestling match between two "Baby Faces." Rotation, rotation, rotation. It's GREAT to hear SO many songs we love that have been missing from the airwaves for FAR too long ... but SOME of these hits haven't been played in awhile for a reason. Not EVERY song belongs in the same rotation cycle. If you're going to play EVERYTHING then yes, there IS a place for "Muskrat Love" by The Captain and Tennille ... but this is a song that, at best, needs to be played twice a year ... at no less than a nine month interval ... NOT twice in the same 24-hour period! It's got enough of a "Wow" factor that you probably WON'T tune it out if you only have to hear it twice a year ... even if you only hang around long enough just to make fun of it one more time. It's kinda like what I said a couple of weeks ago about the Jose Feliciano version of "California Dreamin'" ... although, quite honestly, I can't find ANY justification for ever playing that one ... it wasn't a hit ... and isn't one of those Feliciano songs that anybody is just dying to hear again ... yet I've heard it SIX TIMES now!!! That's about three times as many times as I'd heard it in my whole, entire life prior to this station signing on the air! Why?!?! Who are they hoping to reach (and retain) with these types of decisions? Flipping around wasn't any better ... three different AC/DC songs playing at the exact same time on three different stations ... followed later by three different Led Zeppelin songs playing at the exact same time on three different stations ... followed by two Pink Floyd songs playing at the exact same time on two different stations. Even switching over to a few of the "current" stations gave me Bruno Mars' "Uptown Funk" four times in less than two hours. There truly is no escape ... which is why it is SO frustrating to see Me-TV-FM drop the ball so often when they are SO close to doing things right ... they have been the first station to come along in DECADES poised to make a difference. (One reader referred to their play list as "Leftovers" ... they play anything and everything that every other station in town doesn't or won't play ... to a degree, that's a GOOD thing ... but in moderation ... and in proper rotation. They just don't seem to have that part of the concept down yet.) And while it's nice to be able to click on the station at home via the TV I'm still not sure I get the concept here either ... their ad campaign reads "just one more way you can take Me along with you wherever you go." If you're sitting at home in front of the TV, where are you going? And if you're going, are you REALLY going to lug the big screen TV along with you instead of simply flipping the station on in the car? Again, somebody needs to take a look at their advertising campaign ... because a great deal of it simply doesn't make sense. The writing of that 1965 April Fool's CHUM chart and all of the April Fool's charts CHUM published over the years came from the delightfully warped mind of CHUM's Promotion Director Allen Farrell, who was CHUM's resident zany from 1958 to 1967. Although some of those titles are corny and some don't survive the passage of time, some are very unique to Toronto (Song #21 "Do You Want A Pants" by Tip Top. Tip Top Tailers was a large pants chain in Canada). Some were specifically unique to CHUM listeners. For example, #5 "Please Don't Let Me Be Misunderstood) by Scrooge. Scrooge was the mythical (and Jack Benny cheap) owner of CHUM. Jocks on air always referred to him as a skinflint and that was played up over the years. For a time, Scrooge was even portrayed as a Simon Legee type villian (black moustache, cape, black top hat, etc) by a CHUM salesman named Ray Armstrong, who had a very monotone voice. In actual fact, the real owner of CHUM, Allan Waters, was very generous and loyal to his staff, of which I'm proud to say I was one (starting in 1965 as a board operator and eventually becoming Production Manager). Song #8 "Go Go Now" by CHUM was titled that because in '65, CHUM was calling itself Go Go Radio, "CHUM a Go Go", etc based on the PAMS jingle package "Go Go". To be honest, I don't get some of these titles either (and I was at CHUM then), but they were fun. Gee, I wonder if any radio stations today (even oldies) would even think to do something like this. Of course, I doubt any of them publish charts anymore anyway). For starters, VVN reports that Brian spent about an hour or so on Monday afternoon answering questions submitted by the general public on Twitter. Wilson has a new album, No Pier Pressure, coming out on April 7, and a movie about his life, Love and Mercy, being released June 5, but many of the questions naturally centered around his days with the Beach Boys. While it wasn't quite as telling (or scathing) as David Crosby's recent multi-day answerathon, there were still some interesting revelations although, in many answers, Brian's brevity kept him well below the 140-character limit.On the songwriting process - "I usually do it at the studio and do it on keyboards." Speaking of "Love And Mercy", several FH Readers noticed that "The Walking Dead" closed their fifth season this week with Brian's "Love And Mercy" playing in the background! The new Brian Wilson / Kacey Musgraves track was also leaked last week, just prior to the album's release. It's a very contemporary track and, with Kacey's sophomore album ALSO hitting the streets now, this should prove to be a pretty popular track with radio. I was watching Jimmy Kimmel last night and he mentioned Brian Wilson may be on his show Thursday, April 2, with his new CD. I hope I heard right!!!! Boy, that would have been GREAT to see!! They were so good on TJ Lubinskys 60s show on Public TV. Keep up the Great Work. You are the Master! Will have to check Kimmel's program tonight ... according to his official website on ABC.com, Wilson IS supposed to be a guest on Thursday's show. Brian seems to be doing the full court press when it comes to publicity for this new CD ... and, as I've mentioned before, I think it's his best work since the "Imagination" album several years ago. As for the Jefferson Starship show, we talked about going but then ended up watching the NCAA Tournament instead. While I didn't hear anything directly about the show, there was quite a bit of scuttlebutt upfront about who exactly was going to be there. Eddie Tuduri was happy with it! North Carolina based Ray Road Presents Inc has issued a statement explaining the cancellation of Little River Band’s show at the Reynolds Auditorium on April 3, 2015. Problems started with Ray Road Inc was served a Cease and Desist order. That was followed by a demand from Little River Band management for payment in full by March 26, one week prior to the show. Ray Road Inc’s statement explains, “On Thursday March 26th the company received a written demand from Little River Band’s management that they be paid in full by Friday March 27th. With the copyright issues and potential lawsuits we had no guarantee the band would show up. Paying them in full removed the incentive for them travel to Winston Salem. It did not resolve their copyright issues or the Cease and Desist Order. Their demand was not only unreasonable, but uncustomary. No artist gets paid in full before they show up, rehearse and take the stage. We could not take the risk of turning people away the night of the show. We opted to protect our ticket buyers and offer a refund.” The current Little River Band does not contain one original member. The recent issues started with the non-original band were booked to perform for the Jimmy Fallon show to mark the 40th anniversary of LRB despite no-one from the current line-up being in the band at the start. Following objection from founding member Glenn Shorrock, Jimmy Fallon cancelled the band’s performance. The current status of Little River Band is that the name is now owned by one-time member Stephen Housdon who no longer performs with the band. (Housden left the touring band in 2006). The current line-up features Wayne Nelson who joined LRB in 1980. Nelson left the band in 1996 and returned in 1999. There have been no original members in Little River Band since 1999. While Lennon was never faithful to his wife, it was John who insisted they get married when Cynthia became pregnant with Julian. Manager Brian Epstein suggested keeping the marriage a secret so as not to jeopardize the band's ever-growing fan base ... and most of us will never forget The Beatles' appearance on "The Ed Sullivan Show" when the banner identifying each member pronounced (after showing John's name) "Sorry, Girls ... He's Married". John even wrote a thinly veiled song about one of his many affairs ("Norwegian Wood") and Cynthia certainly was not oblivious to all that was going on outside their marriage (justifying it in some ways, I guess, as "Well, after all ... he IS a Beatle") ... but coming home to find Yoko Ono moved into their home became the last straw. 1970 Spirit In The Sky hitmaker Norman Greenbaum is in critical condition after being involved in a car crash that has left one person dead. Greenbaum was out driving in a Suburu Outback with a friend, Bonita Perea, in Santa Rosa on Saturday (March 28). He was the passenger in the Suburu when it collided with a motorbike. The rider of the motorbike was killed instantly. His passenger is in a serious condition. Greenbaum was also taken to nearby Santa Rosa Hospital and is in serious condition. California police are investigating the incident. Alchohol has been ruled out as a factor. 72-year old Norman Greenbaum is best known for his 1970 hit Spirit In The Sky. The song reached number 1 in Australia and the UK and number 3 in the USA. The song was a hit again in 1986 for Dr and the Medics. The legendary Joni Mitchell was hospitalized Tuesday after being found unconscious in her home. At press time her condition was listed as "serious". And long-time friend of Forgotten Hits, Preston Ritter, the original Drummer for The Electric Prunes, passed away on Monday after a long illness. (Preston confided health issues for the past few years which, per his request, we kept private. We last spoke to him live a few years back when he called in to Dave The Rave's Relics And Rarities Show, which we co-hosted counting down The Top 20 All-Time Favorite Forgotten B-Sides ... but he stayed in communication with numerous emails over the years, most of which were featured in Forgotten Hits. Back in the mid-to-late '60's, he published a book on drumming ... and once famously gave a drum lesson to Barbara Feldon, Agent 99 of "Get Smart" fame, live on The Mike Douglas Show. I think it has been over two years that I first let you know about the "soon to be released" biography of the group, Bread. Do you know what the HELL is going on here? You brought this subject up a year ago in FH. I always check Amazon for the release date and now it has been delayed again (for the millionth time) until next month. If the publisher keeps doing this, there will be no interest left. I think I read somewhere that it may be available in England, but not yet here. Another disappointment is that the only member of the group interviewed for the book was Rob Royer. Not David Gates, REALLY? Anyway, I'm not about to pre-order. We'll see if the book finally makes it out there. Do you know if anybody reviewed it? Oh wait ... it's not yet available. 51 years ago today was Sunday March 29, 1964 -- Easter Sunday. I was working part-time, Sundays, 10 am - 2 pm, at WGH-AM,Newport News. I decided to do a "scoped air check" to save some classic jingles. I kept this on reel-to-reel tape for 45 years, before getting my friend Dale Parsons to digitize it. This is a sample of what Top 40 radio sounded like 51 years ago. Includes produced commercials by legends Dave Cummins and Bob Calvert. And the Kimnach Ford do-nut. 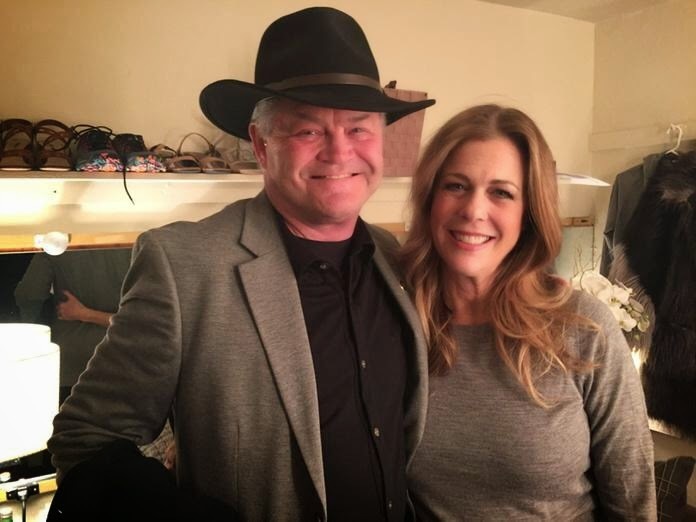 Monkee MICKY DOLENZ, in NYC last week, went to see Larry David’s Fish In The Dark (at The Court Theatre) and greeted actress Rita Wilson after the show, who is in the show. Dolenz and Wilson performed last year and another outing may be in the works. Dolenz next performs with Peter Tork for 3 Monkee-shows; and, then heads to NYC in July to appear at 54 Below. Thought you might like to read this interview about The Chiffons. I would guess you've already noted this, but I felt a little extra loss at the passing of Don ("The Happy Whistler") Robertson. Among his pop hits were "Ringo", "Born To Be With You" and "Please Help Me I'm Falling". In 1966 my C&W (KMOR, SLC,UT) station got a copy of his "Heart On My Sleeve" LP and we played cuts from it at least 10 times a day. It must have sold a bunch in Salt Lake because without me even knowing about it, another copy showed up a few months later, autographed by Don and addressed to me. It hangs right above my stereo and I do play it now and then. It's little memories like this that make my DJ days such a precious gift back then. Thanks for all your work. Keeper of the "Chuck Roast" DJ name alive and carrying on. My niece is vacationing in Florida. She sent these pictures from the Hard Rock Cafe. I think your subscribers might like them. Big story this past week about how Madonna was robbed of a #1 Album in Billboard due to the new way the chart figures are calculated ... we have long argued that it is unfair to rank the charts of today against those from the '50's, '60's and '70's equally when the methodology of compiling those charts is so drastically different these days. Each year, the U.S. Library of Congress adds 25 recordings that it believes are of historic significance to its prestigious National Recording Registry. This year, The Doors, Joan Baez, The Family Stone and Radiohead are among the chosen albums.